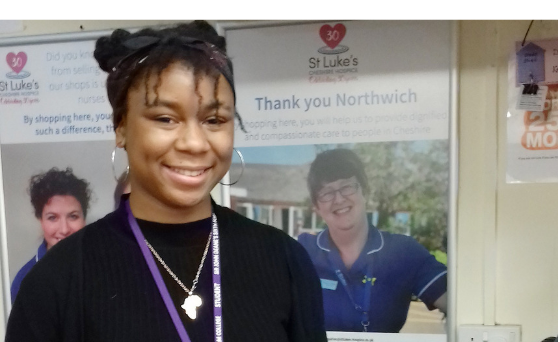 Etochi Aghamelu (Eto), 17, is one of our newest, and youngest recruits to join our team of volunteers at our Northwich shop. After researching a number of volunteering opportunities in her local area, Eto chose to volunteer at St Luke’s for a few hours per week whilst studying for her A-Levels at Sir John Deane’s College. Keen on pursuing a career in medicine, Eto is also keen to carry out a longer placement in our Day Hospice during her summer holidays. Eto helps in the shop every Wednesday afternoon and supports the shop manager, Heather, with tasks such as serving customers on the till, replenishing stock and generally helping to keep the shop tidy. “It’s a nice environment and the people in the shop are welcoming. I gain a sense of satisfaction from helping to raise money for the Hospice. In the short space of time I have been here I feel I have learnt some customer service skills and gained in confidence. If you would like to volunteer for a few hours per week like Eto, please register your interest or email Pam Ford, Volunteer Co-ordinator.